If you recall the Spicy Supply Challenge at Gingersnaps Creation blog we had a challenge to use packaging in our artwork???? 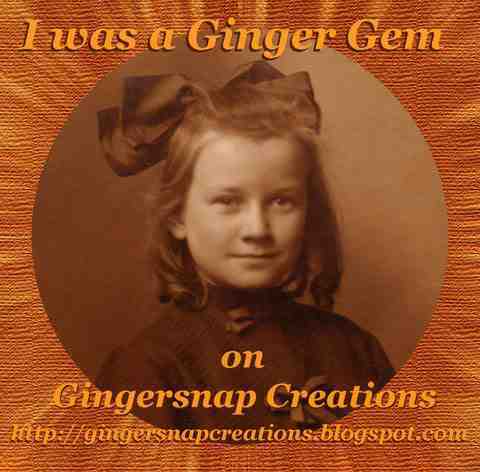 My arch made of egg carton, packing tape etc was chosen as a Ginger Gem. Woot Woot. You can see the post regarding all the wonderful creations here. Gingersnaps always takes me to new heights in my artwork, I truly enjoy the commeraderie and the inspiration this blog has to offer. Thanks again for chosing my artwork Gingersnap Gals and congrats to all the winners of the packaging material challenge. Woo hoo! Congratulations, Les! Richly deserved! And so you deserve to be, that was a great project. Where can I learn about this packaging tape transfer idea? I would like to use that too, it looks great. You sure do deserve it for yr wonderful work!